Improve relationships with family, friends, & loved ones. Your whole family will love your new hot tub, especially a completely customizable Bullfrog Spa. Your children will think the spa is fun and you and your spouse will absolutely love the relaxation, conversation, and romantic spark a hot tub will provide. Bullfrog Spas are the best family hot tubs available. Every member of your family can choose their own personalized JetPak massage. Mom might want to escape with a soft and soothing massage. Dad will enjoy a deep tissue kneading massage after workouts. The kids will love the cool water features. Grandparents will especially appreciate the soothing hydrotherapy and pain relief of the JetPak Therapy System. Your new hot tub will make you the most popular person in the neighborhood. With a new hot tub your house instantly becomes a hot spot for current and new friends. A Bullfrog Spa creates a perfect opportunity for socializing. 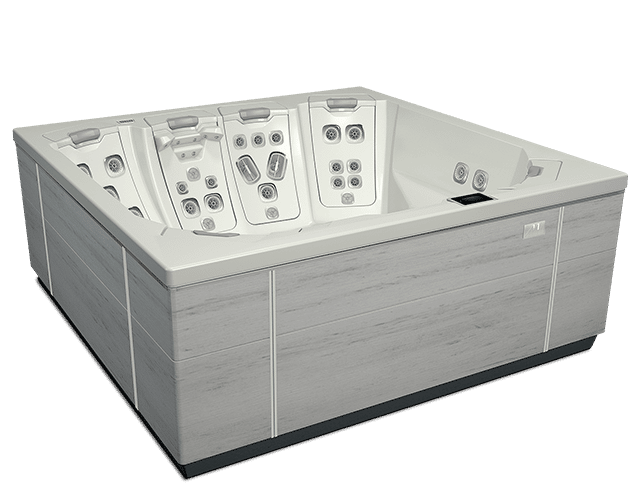 Large spas with open seating layouts like the model A8 or A7 are particularly ideal because they provide plenty of space and personalized JetPak massages for everyone. No other purchase is as cool as a new hot tub in the backyard. Your house will become the most popular spot for neighborhood barbecues, get togethers and hot tub parties. Remember why you fell in love by spending more quality time in your Bullfrog Spa. Reconnect by unwinding as you immerse yourselves in a truly relaxing hydro massage that is personalized for each of you. Owning your own hot tub is simply the best way to create consistent quality time that you both will appreciate. The fresh outdoor air, swirling waters, romantic mood lighting, soft music, and aroma-therapy create a romantic spa retreat without ever leaving your own backyard. Get away from your everyday distractions and allow for true communication and a stregnthened connection.Your relationship will become much stronger as you get away together and share conversation, relaxation, and romance in your own Bullfrog Spa.